Up at 5am today to head north by car. 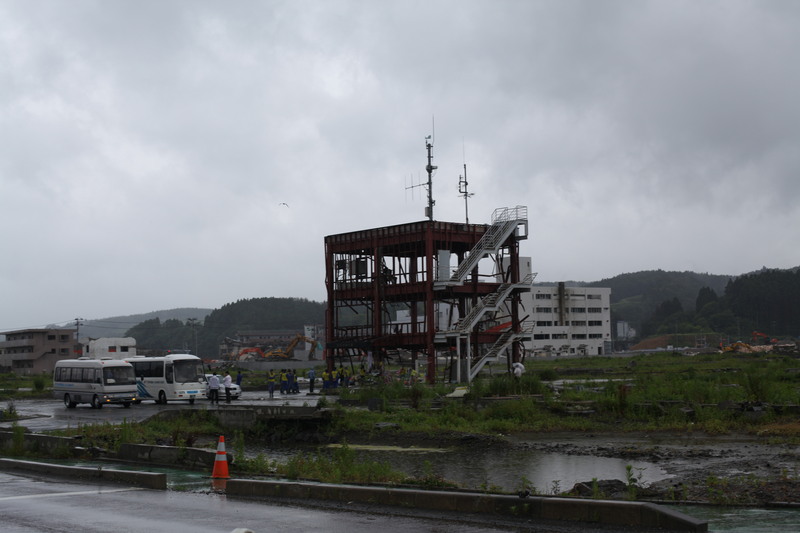 By 8.30 we were at the port of Kesennuma to see the most surreal and vivid expression of the force of the tsunami. A large freighter rests at least 500 metres from the nearest water. For the first time today – but not the last – I struggled to imagine the forces at work. Just how much water is required to float a ship of this scale, then to smash it through every single building in its path for half a kilometre before setting it down? Having watched a few documentaries and a host of videos online of the tsunami I had a good sense of what a tsunami might look like. But no media can cope with the scale of a disaster like this. We drove back south for hours. Every single cove had a village or a town wiped clean. Imagine your favourite seaside town: now imagine the first few hundred metres nearest the sea scraped clean down to the foundations. Every house, every shop, every restaurant. Now imagine that for five hundred kilometres of coastline. 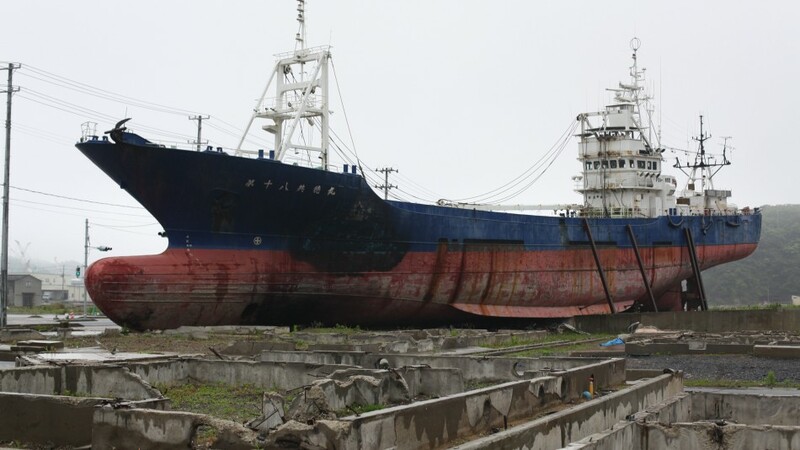 In Miyagi prefecture the impact was made worse by the funnelling of the water as it came ashore. We visited a three storey emergency centre which has become legendary. 30 workers were sheltering on the roof, one woman in particular, calling out the alarm as the water arrived. The water swamped all three floors and then the roof. She, and most of her colleagues, were swept to their death as they struggled to cling to the mast on the roof. We looked up at a hospital high on the bluff above the devastation all around it. It had to be 30 metres above where we stood. On the 11th March, the ground floor had sea water running through it. The main focus of the day was to conduct interviews with two fishermen. I asked them about the sea and about their boats. I wanted to find out about moments when they had felt fear or lost control. Those moments when the sea surprised them. I wanted to connect their livelihood, their metier with the tsunami. And I asked them about how the events of 2011 had changed their view of the government. Both men spoke generously and openly, sharing the horror of what has happened but displaying an admirable focus on the future, on what has to be done. On the way home we passed the elementary school where every child was waiting for their parents to pick them up and evacuate them. 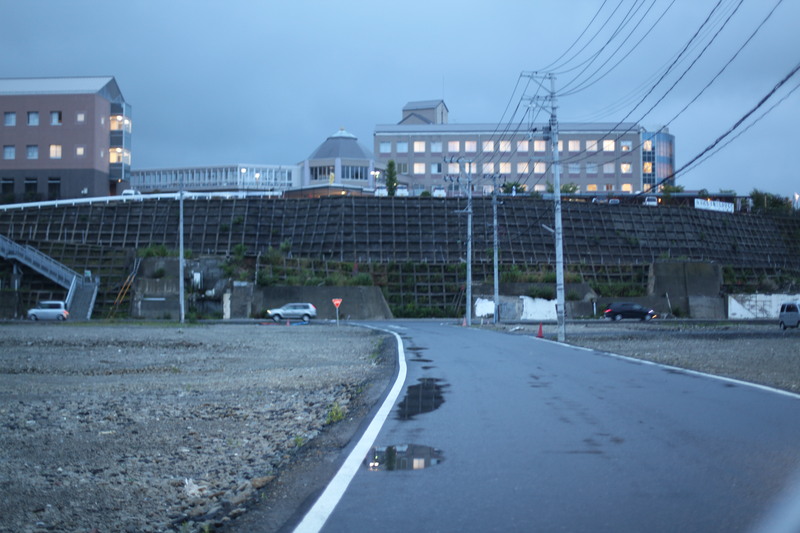 A few wanted to climb the hill behind the school. The teachers told them to come back down. A few minutes later the handful who had disobeyed watched every person in the school washed to their deaths. And so it goes on down the shoreline, through driving rain, story after story of courage, shock and horror. It is not easy to digest a day like this. We drove for 16 hours and never loitered anywhere. But I feel more confident of my ability to engage with these events. The idea of using a boat in our project for Aichi needs to be handled with delicacy but is an appropriate metaphor. The vessel as country, as destiny, as moral framework all come into play. I’ve been thinking a lot about Joseph Conrad’s writing. Lord Jim uses a disaster as the beginning of a dread filled meditation on guilt. And over dinner we discussed Zeitoun by Dave Eggers. The book describes the true story of the false imprisonment and abuse of Zeitoun, a good samaritan who uses his canoe during the aftermath of Hurricane Katrina in New Orleans to help neighbours. Then the paramilitary security forces turn up, accuse him of looting and of terrorism. The crystal clarity of the moral compasses of everyone I’ve met today stands as a heart lifting rebuke to what happened in New Orleans. Up at 5am today to head north by car.